Deck your halls with these cheerful, 16 in. tall electric-lighted, crackle glass holiday displays. 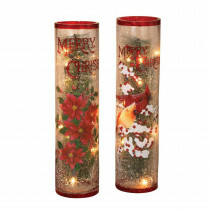 The cylinders are accented with red-rimmed top and bottom, with "Merry Christmas" painted across and beautifully depicting either poinsettias and pines or cardinals and snow-frosted, red berries. Electric, warm white, energy efficient LED lighted PVC pick illuminates the interior of each cylindrical body. Each display has 4.9 ft. of lead cord. Use these merry displays to decorate your hearth or as a festive centerpiece, adding your own special holiday flair and seasonal glow.